We are very committed here at Minchinhampton to all our pupils accessing a wide range of sporting opportunities. To this end we organise many sports at lunchtime, including tennis, basketball, tug of war, cricket, rugby, hockey, volleyball, football, table tennis and netball. The children are given access to resources for all these sports and games are run by staff. We also run a many sports based clubs in school like football, netball, rugby, volland and organise sport at lunchtimes including with opportunities to take part in all types of sport. We also want as many pupils as possible to be given the opportunity to compete in sports. We therefore run a very busy schedule of both inter-house sports in school and sports matches against other schools. For this reason the Minchinhampton sports strip is very important to the children. They feel pride in wearing the strip and representing their school and that sense of belonging that comes from being part of a team. This is particularly important given the inclusive nature of our approach: for a good number of our pupils, it might be the first time they have played for a team and worn a sports strip. It is, understandably, a very proud moment for them. 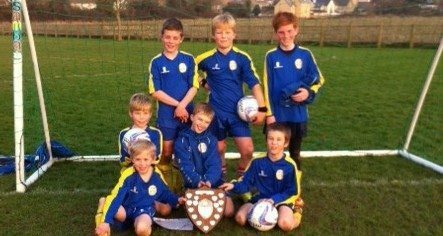 Congratulations to our Year 6 footballers. They are Stroud School Winners 2015. Click above for details of sports clubs we offer at our school, clubs that our children attend out of school and clubs we hope to work more with in the future.